native of central Pennsylvania, David O’Donnell received an undergraduate degree in music from Messiah College and a Master's Degree in voice performance from the Eastman School of Music. While pursing his DMA in voice performance at West Virginia University, David was the Music Director/Choirmaster at the Cathedral of Saint Joseph in Wheeling WV. 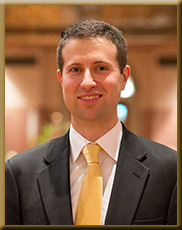 He has also served as Choir Director at Our Lady of Victory/Saint Joseph Church in Rochester NY, and as Schola Master for the Rochester Latin Mass Community. A convert to the Catholic faith, David enjoys adapting traditional Protestant music for use in the Catholic liturgies. He is currently compiling a collection of digital, public-domain hymn scores for use in Catholic churches. In addition to his musical pursuits, David enjoys spending time with his wife and growing family.